PHOTO BY JACOB GURNEY Pictured is the new council committee room at City Hall. The renovations are almost complete. 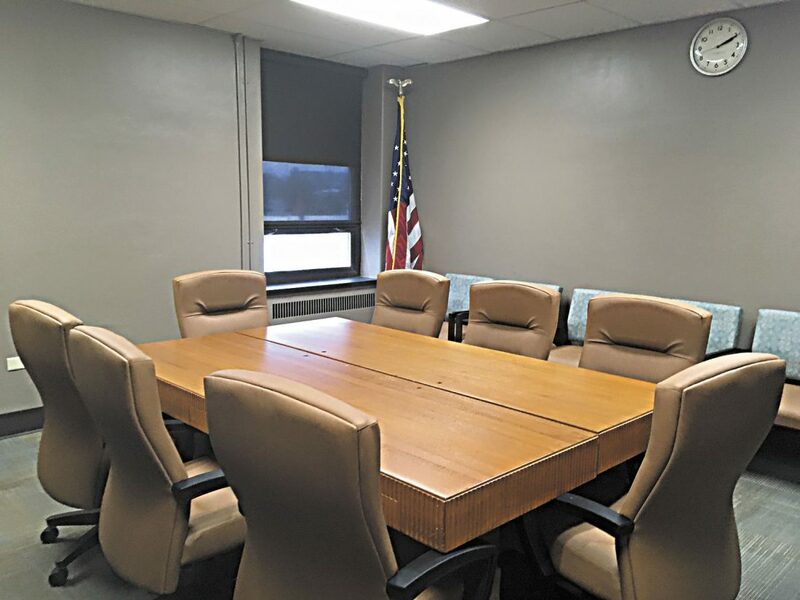 Several offices in Tiffin City Hall have been recently renovated. City Administrator Dale Thornton said employees from Tiffin Public Works Department as well as from Tiffin Park and Recreation Department did most of the work. He said the city council committee room now adjoins the chamber, which provides council members a space to work. The room is to include a work station, cabinets, and a fridge. Tables in the room were salvaged from the old court room, Thornton said. Renovations had cost about $11,000 in total which included new carpeting, repainting and new chairs. “It was relatively inexpensive,” Thornton said. City Council President Mark Hayes said council members now have their own committee room, which was a problem in the past. It often presented scheduling problems because other committees used it too, he said. “Now, we don’t have to worry about that because we have our own. We shouldn’t have any scheduling issues now,” Hayes said. Tiffin Police Department was renovated in late summer of last year. Chief Fred Stevens said when the court moved out of the building and the second-floor hallway became available for use, Thornton and Mayor Aaron Montz told the department heads if they could come up with an idea to utilize the space, they could let them know what it could be used for and what the estimated cost would be. He said his idea was to move adminstrative offices up there and bring the detectives out of the basement. Stevens said renovations cost about $10,600 and the money came out of the police department’s budget. “The only construction was putting a wall and door upstairs and downstairs to secure the hallways. The rest was all cosmetic, like replacing the carpet, adding fresh coats of paint and installing new lighting,” he said. While the court was up there, they had custom-built desks and file cabinets and after looking at the rooms, Stevens said he thought there was no reason to remove them because they were all in good condition. The only demolition they had to do was take a counter and a desking unit out of one of the rooms, he said. The department is now using four office spaces upstairs, which are used as administrative offices for himself, the administrative secretary, the administrative lieutenant and the patrol lieutenant, Stevens said. Additionally, he said all the detective offices were moved out of the basement and onto the first floor, which is the same level as the patrol division, he said. “We saved a ton of money because there was no major construction and we utilized existing equipment already there,” Stevens said. Stevens said he appreciates the mayor and city administrator for getting the department some breathing room after many years and he appreciates finally getting the detective division out of the “dungeon.” He said while the basement is usable, it is from the 1970s and the only renovations done to it since then had been some painting in the early 2000s. Stevens said he didn’t want to put any money into it because they knew the court was going to be moving out, and they didn’t want to waste tax payer money. “That’s why we waited, and while it took four or five years, we didn’t waste money down there,” he said. Stevens said the basement will now be used for extra storage and he thinks that overall, the renovations definitely gave the department breathing room that it “desperately needed.” He said rather than trying to find them in another part of the building, the detectives and patrol officers are all together on the same level which allows for better shared resources and communication. Thornton said other recent renovations include moving the Clerk of Council Office upstairs, which now provides a more adequate working space to support council. He said he wasn’t sure how much the renovations had cost because it came out of the Clerk of Council Budget, but the only items that were added was some new funiture and flooring. Everything else was brought from the previous office, he said. The Engineer’s Office was renovated and now includes its office as well as the Zoning Inspector Office, Thornton said. Each office brought their own furniture, while new paint and flooring were added and it cost less than $5,000 to renovate the two offices, he said. Thornton said all the renovations are complete besides the council meeting room, which still has a little work to be done. He would also like to have the upstairs hallway painted, which he hopes to be completed later this year.